Shellite – X55 Solvent is highly volatile hydrocarbon solvent that performs will in situations requiring a solvent that evaporates quickly with no residue. Can be used as a low residue contact cleaner. A low flash point solvent that evaporates quickly. A weak solvent that is unlikely to affect the surface of most materials. Versatility – Can be included in any formulation where speed of evaporation is required and will combine well with other organic compounds. Solvency – has high solvency of greases and oils. It can be used to clean surfaces prior to painting. Cleaning automotive transmission gear boxes. 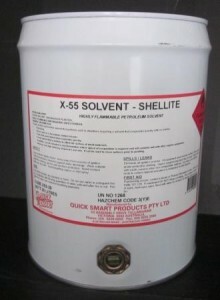 Please consult the MSDS on Shellite – X55 Solvent before use.